Exciting recent evidence proves that humans were living in Clare 12,5000 years ago; a knee bone from a bear that was butchered by humans has been dated to around 12,5000 years ago by Archaeologist Dr. Marion Dowd and animal bone expert Dr. Ruth Carden. This discovery from near Ennis is the earliest evidence for humans anywhere on the island of Ireland and means that our ancestors arrived 2,500 years earlier than previously thought in the Palaeolithic Period. The earliest evidence we have for the first inhabitants of the Burren comes from Fanore where hunter-gatherers arrived sometime before 4,000 BC. Recent work by archaeologist Michael Lynch has identified shell middens, sites of discarded cooked seashells, along the coast which have been dated to the latest Mesolithic Period around 6,000 years ago (4,000 BC). It wasn’t until just after the start of the Neolithic Period (4,000 – 2,500BC) that humans began to make a permanent mark on the landscape. This group of settlers started building large stone structures to commemorate their dead. The most visible remains of their former presence are the megalithic tombs they built, such as the portal tomb at Poulnabrone which contained bones that have been dated to 3,800BC by archaeologist Dr. Anne Lynch. This is the oldest large scale human structure that is visible in the landscape of Ireland. Throughout the era known as the Neolithic period (c. 4,000-2,500 BC), these farmers raised their herds on the gentle southern slopes of the Burren. The Burren was good to them, but we have evidence, including large scale tree clearance, that by the end of the Neolithic period and into the Early Bronze Age (c. 2400-2000 BC), an increasing population may have put considerable pressure on the Burren’s resources. 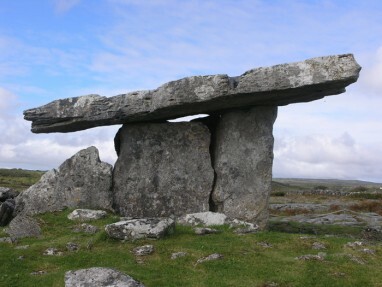 There are 4 types of megalithic tombs in Ireland: court cairns, wedge tombs, passage tombs and portal dolmens. Poulnabrone Dolmen is a portal tomb situated near Carron, 8 km (5 miles) south of Ballyvaughan and 9.6 km (6 miles north-west of Kilnaboy. It dates back to the Neolithic period around 3,800BC. Located on the bare upland limestone landscape it has become one of the iconic images of ancient Ireland. In 1985 the flat cap stone was temporarily removed to allow replacement of one of the support stones which was cracked and in danger of collapse. A detailed excavation of the site was conducted by Dr. Anne Lynch of the National Monuments Service. The partial remains of between 16 and 22 adults and 6 children were found buried under the monument. Personal items including stone tools and jewellery were buried with them. 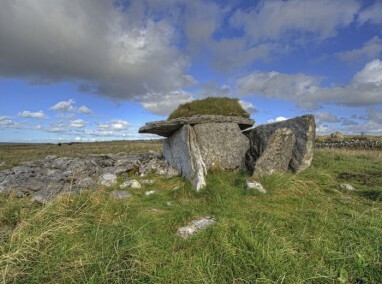 Poulnabrone Dolmen is accessible to the public and managed by the Office of Public Works and Clare County Council. Wedge tombs are smaller structures also built with upright stones and flat roof stones. The Burren contains eighty wedge tombs (all of which date to this period) and represents the densest concentration of this type of megalithic tomb in Ireland (wedge tombs were the last type of megalithic tomb to be built). The unique environment of the Burren has also ensured that much more ephemeral remains of these peoples’ farms and field walls are still visible as low grass-covered mounds over 4000 years after they were built. After this boom time in the Final Neolithic/Early Bronze Age, the population focus may have shifted beyond the Burren and towards south-east Clare. The Burren was not completely abandoned however, and spectacular finds such as the large gold Gleninsheen gorget are a testament to the significant activity on the Burren in the Bronze Age (1500-600 BC). Pollen evidence for a regeneration of trees on the Burren during the subsequent Iron Age (600 BC-400 AD) indicates an even greater drop-off in farming and population that lasted until the Early Medieval period (400-1300 AD), when the trees were re-cleared and the population of the Burren increased once again. ‘The Burren and the Aran Islands – Exploring the Archaeology’ by Dr Carleton Jones, Archaeologist, NUI Galway.